Apparently Samsung is expected to launch the first device with a flexible OLED display and they will name it Galaxy Round. The date October 10 has been speculated as the launch date but it’s just a rumor for now. We also heard news about them launching a Galaxy Note 3 spin-off with a flexible display, but it’s also a rumor. The name Galaxy Round has already been trademarked by Samsung so this gives us an extra hint on the name of the upcoming device. A while ago, D.J.Lee (Samsung’s mobile business head of strategic marketing) stated that Samsung is planning a curved display device in October for South Korea. Regarding the specifications, it seems they will be similar to the ones of Galaxy Note 3. A 5.7 inch flexible OLED screen, Qualcomm Snapdragon 800 CPU and a full HD resolution. This could also match a side version of the Note 3 with a flexible display that Samsung is thinking about releasing. What are the benefits of a flexible display? Well first of all, they are kind of made of plastic, so durability becomes the number 1 advantage. Second, it’s going to be cheaper to produce these screens compared to current models. 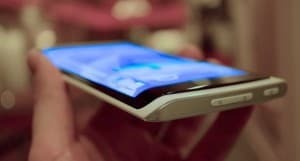 When you think about the design of this flexible phone, you may be thinking that you can bend the phone or something like that, but that will be wrong. The phone will have a rigid structure without any possibility to bend it. However, the fact that the display is flexible allows for more irregular phone shapes, especially curved shapes that allow a better fit over the face. We’ll update you with new information as it comes up.